Ron and I went to Amsterdam on our second day, to see the Jewish Historical Museum (left) and the Portuguese synagogue. They are across the street from on another, near the center of the city. Across a second street is a large church, the Church of Moses and Aaron, and an open-air market. 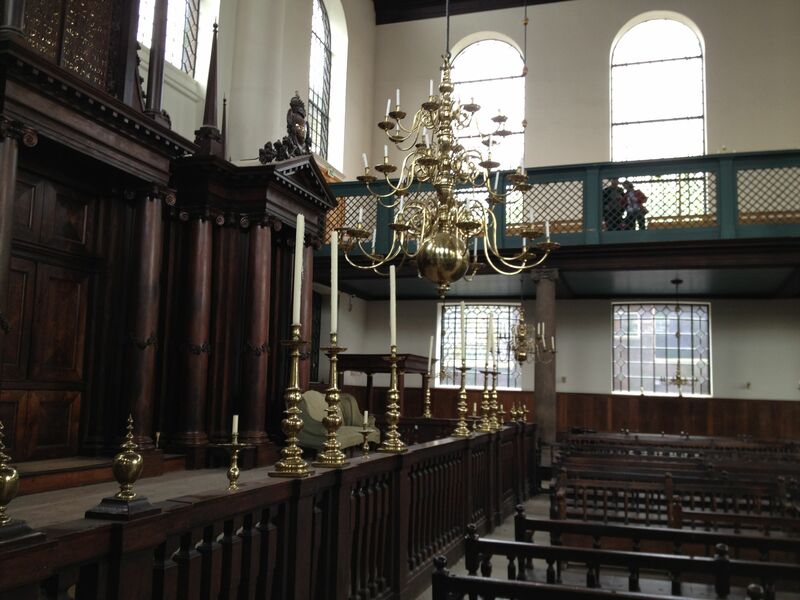 In 1671-1675, Amsterdam’s Portuguese Jews built a very large, impressive synagogue, which is still home to an Orthodox congregation today. Stand outside the synagogue square, and look to the left, and you’ll see the Jewish Museum, built in a former synagogue. Look around, and there is an entrance to an amusement park (underground), the trolley tracks, and an open-air market. Across the street, there’s a big church, with large statues at the top and carved letters identifying it as the Church of Moses and Aaron. Once a Catholic church, the building is now used mainly for other purposes, such as a youth club. The intertwined histories of the people of the Netherlands show in the history of the church and synagogue. The church was originally a Jewish house, purchased in 1641 by Catholics who were forbidden by the Protestant government from worshipping publicly. 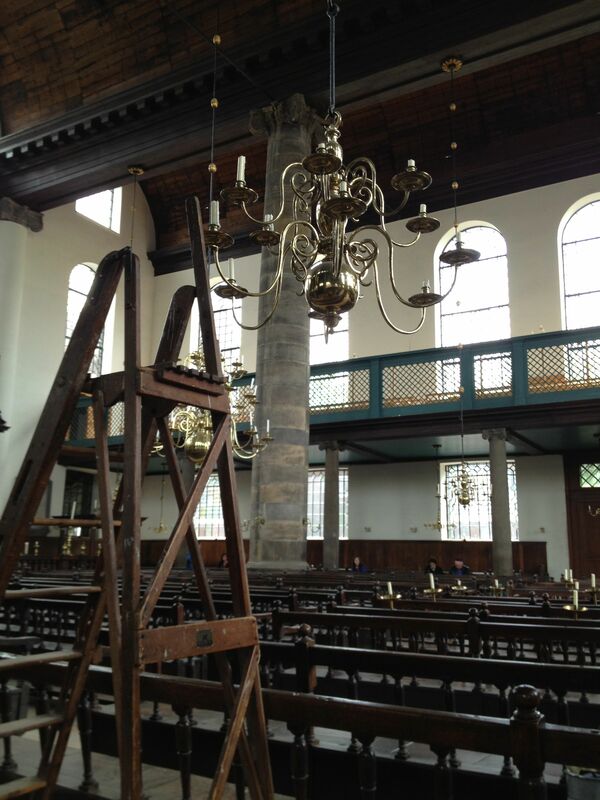 The Catholics turned it into a church, in the middle of the Jewish quarter of Amsterdam. When Nazi Germany invaded Holland in 1940 there were around 140,000 Jews living here, some 120,000 of whom lived in Amsterdam; of these about 4,300 were Sephardi Jews. The synagogue was left undamaged. Why is still a mystery – it was certainly an exception in occupied Holland. After the war there were only some 20,000 Jews left in Holland, about 800 of whom were Sephardi. At present there are between 20,000 and 25,000 Jews in Holland, around 15,000 to 20,000 of whom in Amsterdam. The Portuguese Jewish community has about 600 contributing members who live, like most of the Ashkenazi community, outside the city centre. History lives on every corner here, with hundreds of years and lives and deaths and wars tumbling over one another. 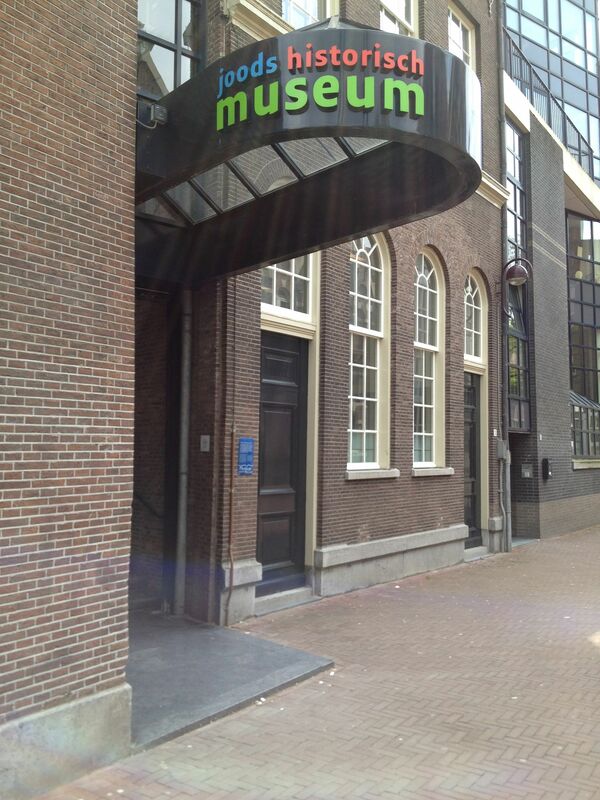 A short distance away is the Anne Frank museum, the house where she and her family hid from the Nazis. You can walk up the same stairs she walked, and peer out the windows that were, for so long, her only view of the world. The Portuguese synagogue goes back centuries further, to another era of persecution. The Portuguese Jewish community is Sephardic, or of Spanish origin. The German (and Eastern European) Jewish community is called the Ashkenazic community. 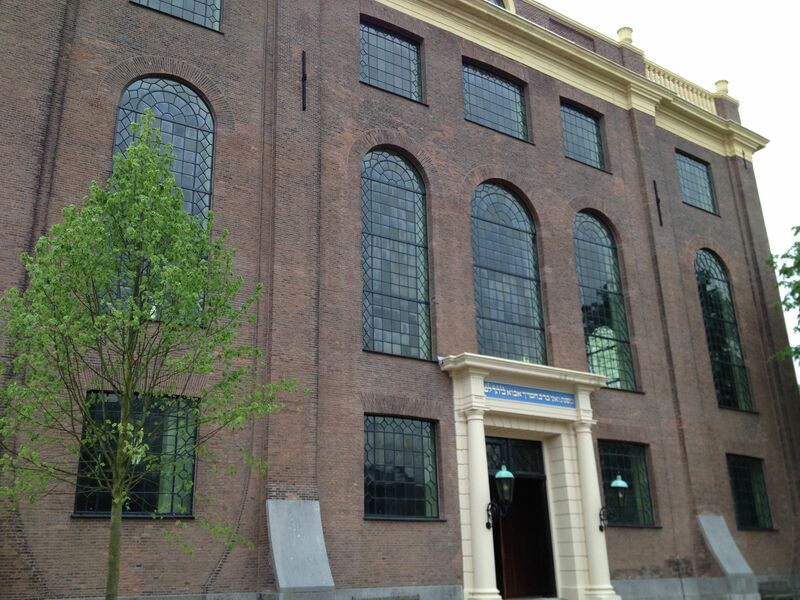 The Portuguese synagogue in Amsterdam is also called the “Esnoga,” which is the Ladino word for synagogue. Ladino is a Spanish/Hebrew language, as Yiddish is a German/Hebrew language. The Portuguese synagogue is in the middle of buildings that form a square. An interior courtyard was planned to provide space for people to come and go during services, and for children to play safely. 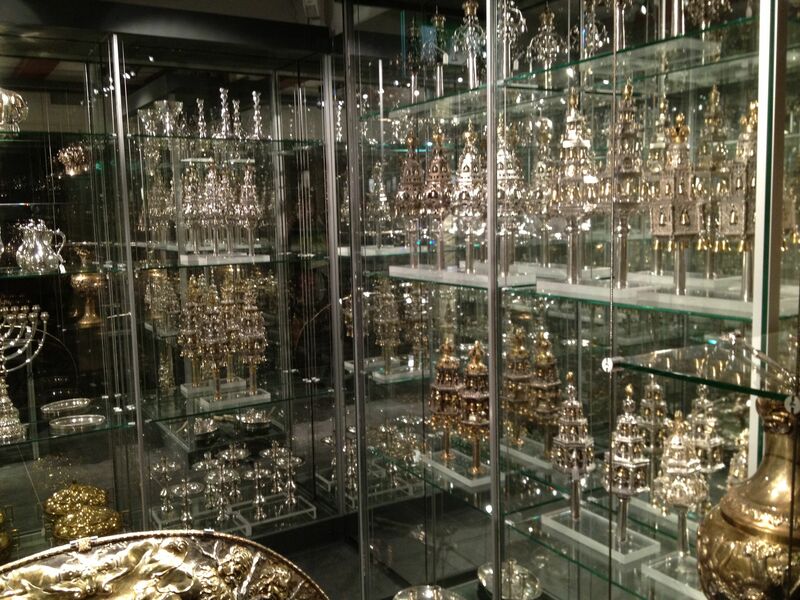 The buildings include an old mikvah, and one currently in use, as well as offices, a cheder (school), a gift shop, and a treasure room full of silver (below). One of the buildings of the square is a winter synagogue, which has heat and electric lights. A library (viewed from behind a glass window) has volumes that are hundreds of years old, and appear to be in current use — looks like bright pink and yellow Post-It markers attached to them! 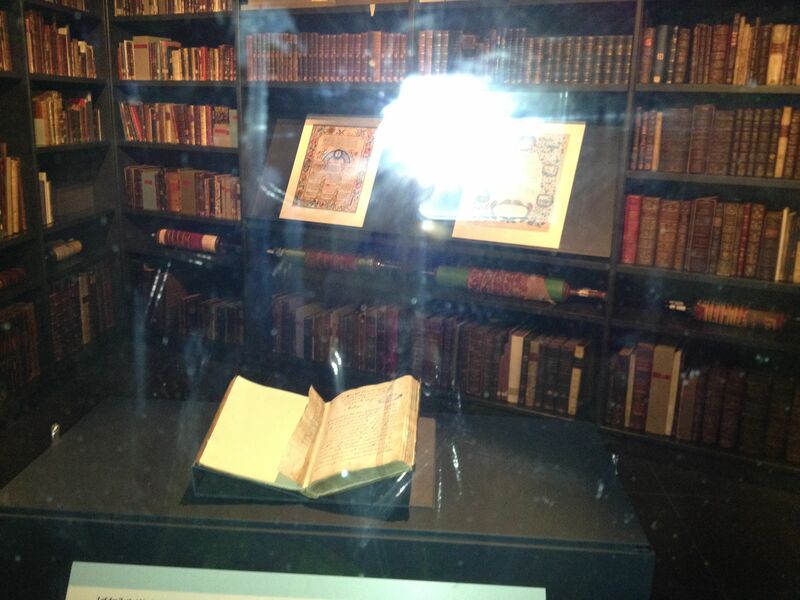 The oldest book (above), on display in the treasure room crypt when we were there, is the first translation of Erasmus, a Dutch priest, teacher and theologian who died in 1536. The synagogue itself is very large, with old wooden benches for men, including hinged seats that lift up to reveal storage for prayer shawls and books. The sanctuary is lit by candle-filled chandeliers. While we were there, someone brought in a tall wooden ladder and candles, but we did not see him actually replacing the candles to be ready for this night’s service. One of the buildings in the square houses the candle room, for large numbers of candles are needed to light the synagogue. The Ark is set on the eastern wall, with couches on both sides for the “bridegrooms of the Torah.” Balconies for women encircle the sanctuary, and can be reached by their own separate staircase from the outside, so that women never have to set foot in the main sanctuary. On one side, there is a stall that seats about ten of the elders/leaders. The bima is in the center of the synagogue, very large and ornate, but separated from the Ark by quite a distance and by many pews. It’s an arrangement that is unfamiliar to me, but the synagogue’s website says it is an Iberian/Sephardic arrangement. After visiting the synagogue, I saw a streetcar that was plainly marked with the Central Station destination, so we hopped on and went to the train station, and from there, back to Utrecht. Enjoyed this and learned a lot (and I have visited Amsterdam. Thanks for this post. Thanks for an interesting visit. Your whole trip sounds wonderful.